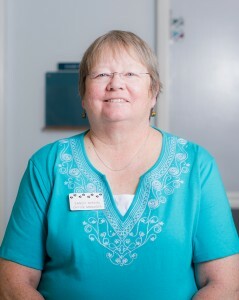 Sandy is a huge part of the clinic and keeps it running smoothly. She started working here in the summer of 2004, after initially working as a receptionist at Wilderness with Dr. Rice and Dr. Zimbelman. When she was younger she wanted to be a veterinarian but went to school to be a technician instead. While in school she interned at a large animal practice since she was interested in working with horses. What she loves most about working at the clinic is seeing clients come in with their new pets and all the joy it brings to them as well as meeting new people. Currently, she has two cats, Pudge & Rue, and has previously had four dogs as well. Outside of the clinic, she enjoys scrapbooking, horseback riding, gardening and playing with her grand children.